I love almonds. I love the taste of them. I love to use almond oil on my skin and I also adore almond milk. In fact, since I changed my way of eating, I am putting Almond Milk in my cereal, in my coffee and in smoothie, too. I even made a homemade vegan ice cream with it last week. Since I have pretty much eliminated dairy (I did cheat and have some parmesan on pasta the other night, as well as a homemade carrot cupcake from Cheesy Eddie's) from my diet and quite eating meat (since Memorial Day on the meat! ), my skin is brighter and even softer. Health-wise, my blood pressure (which has been high for 3 years requiring daily medication) is NORMAL these days! I still require my medication, but for the first time I continuously get normal reads on my blood pressure monitor instead of all the crazy ups and downs. 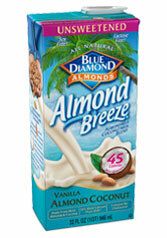 *Almond milk is rich in potassium, magnesium, and vitamin E.
*Low in carbs, calories, and gluten free! *My favorite, the unsweetened vanilla coconut almond contains just 45 calories and has 45% of the RDA of calcium in each glass. Let's talk about the benefits of almond in skin care today. Almond for the skin truly is a food for your skin. Rich in antioxidant vitamin E, products made with almond oil and almond milk help to protect the skin for environmental damage. Products with almonds can help to nourish the skin and reduce the appearance of fine lines and wrinkles. It also is ideal for very dry and delicate skin. Almond oil can give a shiny and silky appearance to the hair, while almond milk is soothing when applied topically to the skin. Crushed almonds can be mixed with natural vegetable oils to make a scrub for rough, cracked heels. There are just so many wonderful benefits to this simple nut!